Ultra Light Graphs, or ULG for short, is a tool that allows you to create basic graphs using nothing more than a few lines of text. The text format is designed to be meaningful in itself, which makes ULG a sort of markup language for graphs. It isn't intended to replace something more comprehensive like graphml or dot, but it does allow you to quickly write something that is readable in your favourite text editor and can be turned into an image that you might want to insert into documentation etc. ULG is very easy to use. Just give it a file with the text in it and it will generate a png by default. Notice also how we've also explicitly marked "web dmz" as a box. Quite a few things have happened here. Looking at the text, you will have noticed three lines starting with the word "option". These are basically just option names and values that get passed directly to Graphviz as global options. The "internet" node was labelled "internet" and not "Internet". This is because ULG defines styles based on the first occurrence of the node or edge. Because we included backoffice.ulg first, it defined the style for the internet node. 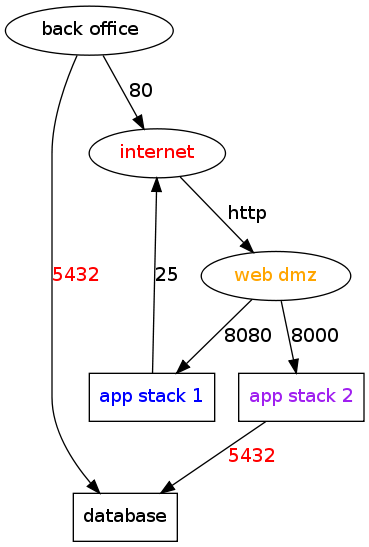 This also means that once we have defined a node, such as the "(web dmz|orange)" we ignore any style characters and simply use the label. 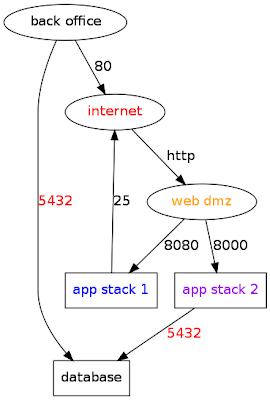 The next two occurrences were referred to as just "web dmz". Another thing you will have noticed is the use of colour. This is achieved by simply adding "|colour" to the node or edge label. 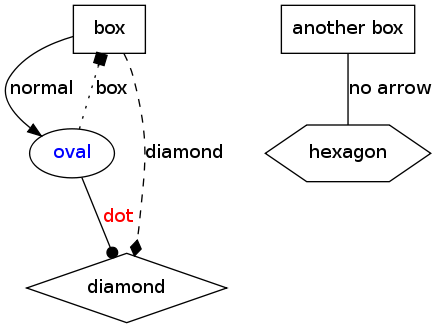 Any colours Graphviz understands should be fine. 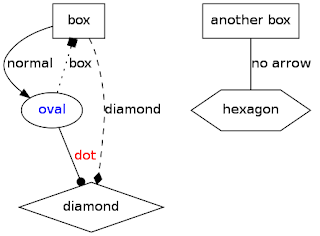 Finally, this example shows the different combinations of supported node and arrow styles. Hopefully this example speaks for itself. Regularly backup systems and data using a combination of incremental and full backups. Even on local networks. You may have perimeter firewalls and a switched network, but you have to assume someone is listening. Reduce the attack surface for remote access and local privilege escalation by only having essential software installed and services running. Not only does this simplify diagnosing operational issues, but means a compromise of one service doesn't directly affect other services. It also reduces the possibility of another service being used in the next stage of an attack. This should apply at all levels, from system accounts to application logins. Don't use shared credentials and use systems that have granular enough permissions. Someone might not want to do something malicious, but if their system has been compromised the attacker might. Unpatched software is a liability. Every unpatched system is low-hanging fruit for an attacker. You should have a clear insight into the standard operational and opsec behaviour of your environment. This means having good operational monitoring and metrics, security systems such as HIDS and NIDS and a hardened centralized log collector for system logs and SIEM. Once you have that, take the time to review logs, events and set up alerts if possible. Compromise is inevitable so the trick is to limit damage once it happens. Network segmentation stops the attack from moving around freely and thus adds complexity and delay to the next stages of their attack. This applies to everything from choosing a password, to storing passwords and encrypting backups. Don't rely on home-made encryption or obfuscation tricks. It is a question of when you get hacked, not if. You should have an incident response plan well in advance of anything happening. Basics should include how to limit damage, how to collect information for forensics or the authorities and details of who to contact. When you buy a new piece of kit, build a new system or install an application, or should remember to check and adjust any default configuration. Most things try to be easy, not secure, so leaving in default configuration can be dangerous. Default users are a classic example, but other more subtle configuration might give too much information away or might be permissive in terms of access or actions.